Nepenthes rajah is one of the classic highland Nepenthes. 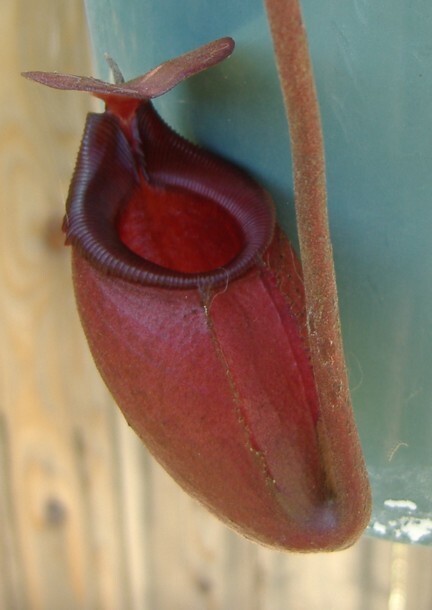 It produces some of the biggest pitchers, if not the biggest pitchers, of all Nepenthes. I have had difficulty getting this species to pitcher for me outdoors and to thrive. They can be subject to transplant shock after importing or repotting and takes even more time for N. rajah to acclimate to my outdoor conditions. Some of my best plants have needed a good year to get established and start growing. This species doesn't really vine and gets extremely large so you don't see this species in hanging pots. However, I've recently been growing them that way and they don't seem to mine. Jeremiah at The Colorado Carnivorous Plant Society has posted photos in some of the forums of incredible greenhouse grown N. rajahs. Seems that when the pitchers are forming, they place a pot of sphagnum moss below the pitcher to rest on to encourage pitcher development. From the looks of Jeremiah's N. rajahs I would agree. Prices have dropped on this species with the majority of the clones coming from Borneo Exotics.